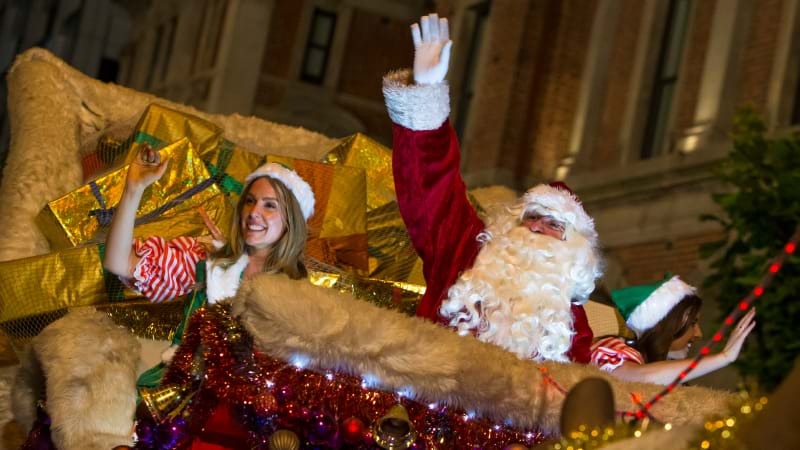 There’s only one more sleep until the 47th annual RAC Christmas Pageant, supported by the City of Perth, Channel 7 and The West Australian, once again lights up the streets of Perth. This year’s Christmas Pageant will feature 17 floats and 66 participant groups of entertainers, dancers and musicians. 2018 will see a range of participant groups including BMX riders and annual favourite the fire engine. RAC will be providing pre pageant entertainment from 6.30pm with Carollers, Stilt walkers and Fat Santas roaming down St Georges Tce to entertain the early comers. Telethon have their own Christmas cheer, represented by a Batmobile and Blues Brothers car with superheroes participating in the pageant. Plus, well known 2018 Telethon stars Kaide and Charlotte will be on board spreading the festival love. Favourite floats returning for 2018 include the Nativity, Captain Pageant, the Swan River Steamer, with Samantha Jolly and her son Harrison sitting atop, as well as The West Australian’s Design-A-Float, featuring the winning hand drawn designs for an ‘Under the Sea’ Theme. Santa’s Sleigh has been refurbished with new lights, and decorations plus LED lit presents and gold painted reindeers. Seven News presenters Susannah Carr and Rick Ardon will be getting into the Christmas spirit, along with Today Tonight’s Monika Kos, as they lead the pageant on our giant present float. The three wise men will be from the Seven and Today Tonight news rooms – Rob Scott and Graeme Butler, and Sunrise’s Perth correspondent, Matt Tinney. Seven News and Today Tonight reporters dressing up for the pageant include Adrian Barich as Captain Hook, Monique Dirks will be playing it up as the Queen of Hearts on the Alice in Wonderland float, Chantelle Toohey will shine as a princess on the Snow Man float and, showing off their cheeky side will be Syan Dougherty and Emily Baker as Santa’s elves on his Sleigh, while Elle Georgiou and Amber Johnston will be Santa’s helpers in his workshop. The RAC Christmas Pageant is certainly the state’s premiere family event, attracting enormous crowds to the city on the day – and it also attracts further hundreds of thousands of viewers on Channel Seven and throughout regional Western Australia on GWN. The RAC Christmas Pageant will be shown on Channel Seven and GWN at 7pm on Saturday, December 8, a week later than previous years and repeated on Christmas Day at 10am on Channel Seven and GWN7. Seven News’ Amelia Broun and Geof Parry will be providing the commentary, with this year Mark Gibson will be the roaming reporter on ground getting more of an insight into the floats, the crowd and the amazing community which the RAC Christmas Pageant brings to Perth. St George’s Terrace and surrounding roads will be closed from 4.30pm. For information on public parking phone 1300 889 613 and for buses and trains please phone 13 62 13. 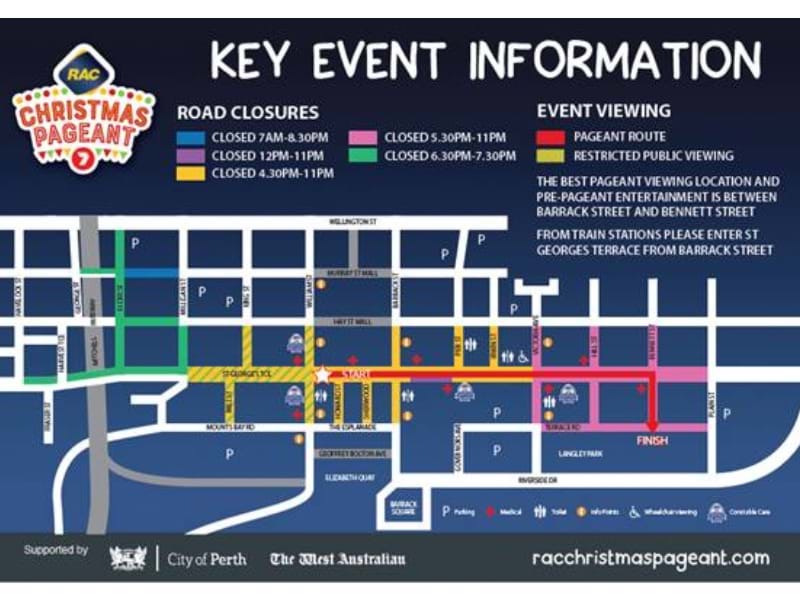 Details on road closures, the pageant route and services available on the day can be found at www.racchristmaspageant.com or follow us on Facebook - @RAC Christmas Pageant and use #xmaspageant.